In addition to early access to the game, the Day Zero Edition features two custom weapons, the AK-12G Assault Rifle and CROSSBOW-B2. And players who pick up the Day Zero Edition will be able to level up quickly with a full day of Double XP on November 3rd. Finally, the Day Zero Edition also includes the Advanced Arsenal Bullet Brass exoskeleton and EM1 Quantum directed energy weapon. Play before the rest of the world with the Call of Duty: Advanced Warfare Day Zero Edition. Developed by Sledgehammer Games (co-developers of Call of Duty: Modern Warfare 3), harnesses the first three-year, all next-gen development cycle in franchise history. 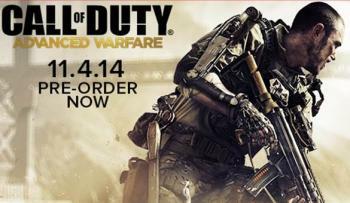 Harnessing the power of next-gen platforms, Call of Duty: Advanced Warfare brings players into the battlegrounds of the future by boasting a new hi-tech, advanced arsenal and ability set, arming players with all-new equipment, technology, perks, and vehicles like hoverbikes and highly specialized drones. Players can also choose between standard ammunition and an all-new class of directed-energy weaponry that enables totally new gameplay dynamics. And with exoskeletons delivering a massive force multiplier and unprecedented tactical freedom, Call of Duty: Advanced Warfare evolves every firefight.